When leaving home for a distant place became less about brawn, women finally had the opportunity to venture out on their own. No longer were we stuck at home, waiting for our men to return and tell us stories about lands far away and people so different it was difficult to imagine what their lives were like. 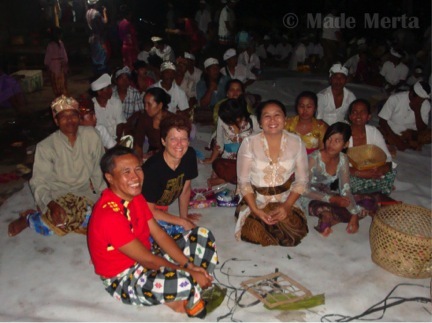 Now, even a lone woman traveler is not unusual, though we still have certain limitations that men don’t have. Care does have to be taken with our personal, physical safety; certain places and situations avoided. But overall, thankfully, it is a big wide world open to us. I found this new dimension Les Village on the northern coast of Bali. Converse communities still exist in Bali, particularly when comparing Les with Ubud, Bali’s cultural center, in the south. 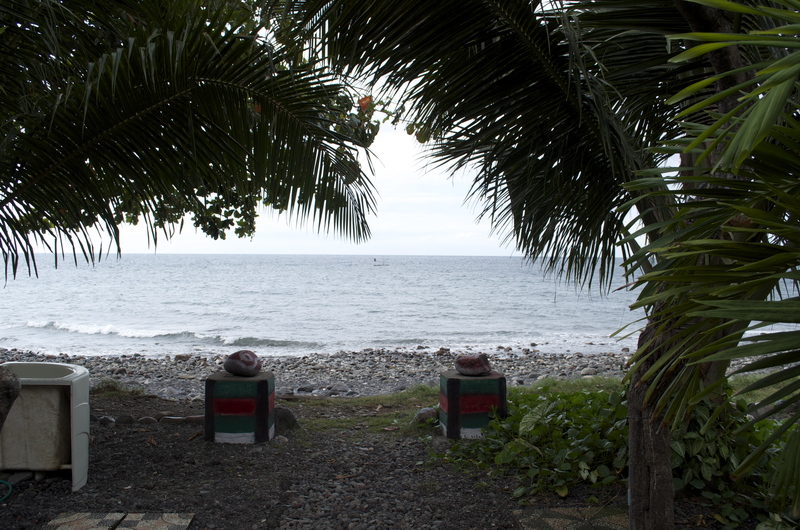 Though Les is not untouched by Westerners and westernization, it is still very far from being a tourist destination. It is, primarily, a fishing village of approximately 7,000 people. 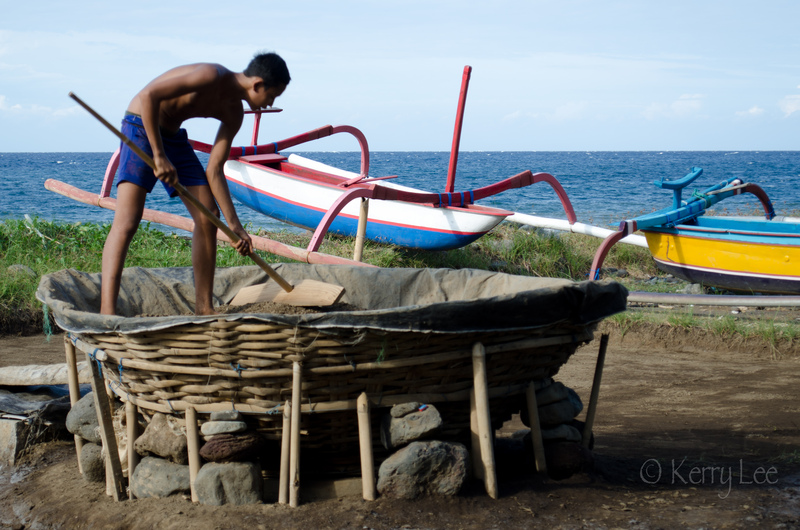 Making salt from the Bali Sea water is a trade here as well. There are also farmers. Local crops include cloves, vanilla, and some cacao. I also saw papaya, jack fruit, breadfruit, mangoes, taro, corn, red chilies, cassava, and water spinach. Pigs, chickens and a few cows are scattered at individual homes. Bali is the lone Hindu island in the Indonesian archipelago, so when people are not fishing or farming or making salt, they are preparing for and attending ceremonies. I was very fortunate to be invited to attend the fisherman’s ceremony on the beach Monday night. The men in the village were planning, at the full moon, to thank the gods and the sea for their livelihood. 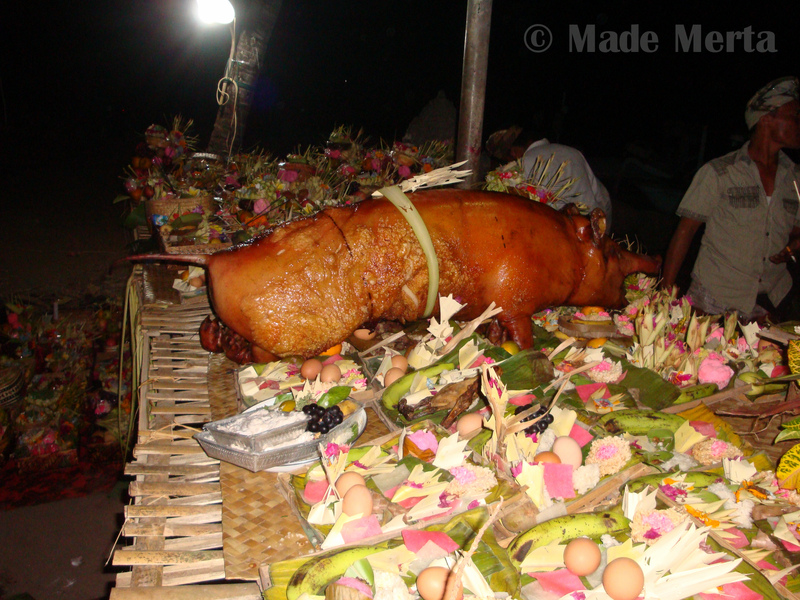 One pig was slaughtered in the morning, and then spit roasted all day. The fisherman carried it in on a large pole, depositing it on the altar. Taking place on the beach, the altar was a long, makeshift, wooden table. The rest of the preparations took all day. The women made trays of offerings, including fruit, luminous white rice treats dyed pink on the top, flower petals, and incense. The men laid down tarps for the celebrants to sit on, and a sound system for the leader was set up. The ceremony was to begin at 8:00 pm. My children have officially labeled me a hypocrite (since I forbade them all their lives to ride motorcycles) because a small motorbike was the only mode of transport available for me to reach the ceremony. Sans helmet, I grasped my driver around the waist and a low level of hysterical giggling bubbled from me as we raced down the highway, Indonesian style, to our destination. Having safely arrived at the beach, a front row seat was made available to us. We had been diving with the head fisherman all week, so we were his guests. I did not understand the language or the ritual, but it was all beautiful nonetheless. There was background music, prayers, incense, grains of rice lofted through the air, holy water shaken off palm leaves, and a white string to tie around the wrist for good luck. 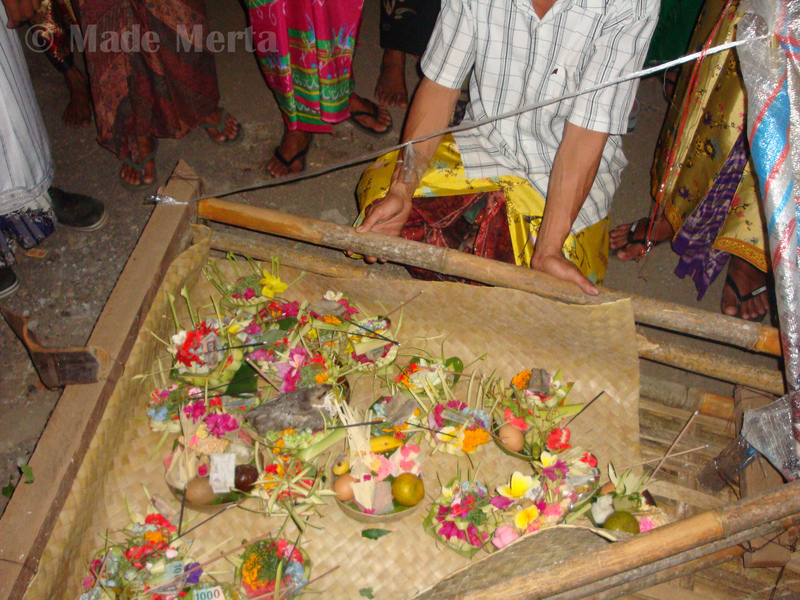 The ceremony culminated with each fisherman placing an offering of food and flowers, with some money tucked underneath, in a small bamboo replica of a fishing boat. There was a chick and a duckling ensconced there as well. The little boat was pushed out on the water. When the first wave pushed it back, I was happy to see the birds were removed. Then the boat was pushed out again, the waves taking it away to sea. I had a safe return on the motorcycle and slept very soundly, dreaming of the large, wooden, blue and white boats on the horizon, and huge schools of fish swimming under them. beautifully written. i who often get lost in long sentences love the cadence of your shorter sentences. loved as well how you angled les village using local colors. Garri! Thank you!! More to come. I hope Pac Eka likes his photos published. Kerry, as always, I love your writing and the photos are the perfect accompaniment. I especially liked your description of the ritual — “grains of rice floating through the air…” I felt as though I was there with you! What a magnificent experience you are having! You just know how to do it! Thanks Jeanie! So nice to hear from you, and as always, such kind words. Les Village in Bali was quite a magical experience. I am anxious to return. Thank you. Beautiful story and a lovely reminder for me that this is a shared planet. I laughed, imagining your relief, when the duck and chick were removed from the ceremonial boat–on the other side of the world from your current home and still concerned for the welfare of life! Thank you for your journey and your words so I could go there in a small way too. Haha you know me! I was going to sneak around the back and do a quick rescue when the boat went out, but no need!! Thank you for your kind comments – the trip was a huge reminder for me that this is a shared planet…. awareness level ratchet up!! It was a lovely journey.